Who can resist his vocal charms? You can read an excerpt from Colin Escott's book about Hank Williams. Hank Williams Sr. Some lyrics,text, and sounds. This Honky Tonk Homepage includes a few Hank Williams songs. Hank Williams A *few* words from the rock and roll hall of fame. "During his fabulous career, Hank placed over 85 singles on the Billboard best seller list and sold nearly 90 million records, making him one of the biggest country music stars ever. " Thanks to Hank Eleazer for this suggestion. Hank Thompson has been making musical magic for six decades. Thanks to "SandersNL" for the suggestion. Hank Cochran"To read this story is like reading a best-selling novel. It reads like the very history of country music. If Hank wasn't here to tell it, you'd almost swear it wasn't true. This really is the stuff that Legends are made out of." Amy and the Hank Sinatras are a New Orleans group that play a bit of everything - from Hank to Frank. Thanks to Amy for letting me know about the band and the site. Hank the Band found the Hankweb! Their homepage freatures information about the up-and-coming album and tour dates. 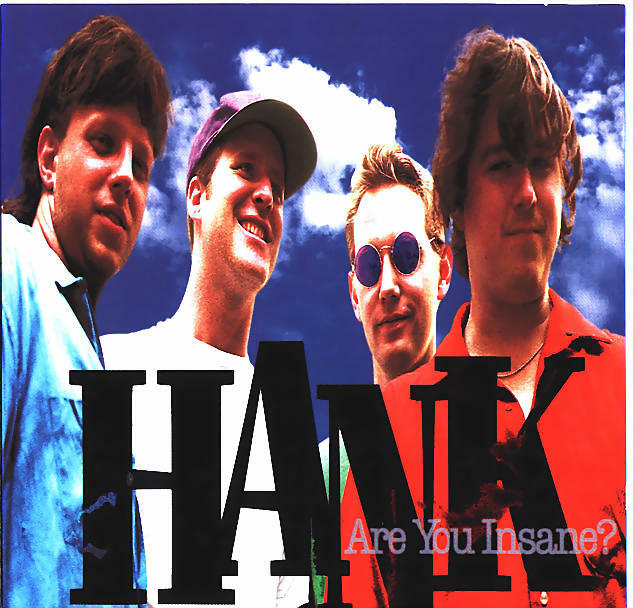 "Hank's music has been described as "Scorchin' Countrybilly" or "Johnny Cash . . . with The RAMONES backing him up!" His voice has been compared to Stompin' Tom Connors', Greg Keillor's, Johnny Cash's and Dwight Yoakam's." Speical thanks to Lori Allen for pointing this band and the link out to me. Hank Deluxe has a thing for the blues. 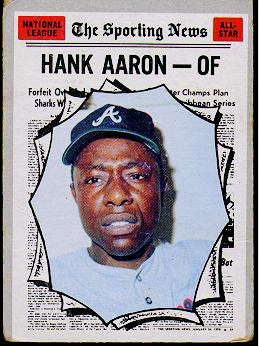 Here is a scan of a really nice Hank Aaron Baseball card that I was lucky enough to pick up at a flea market. Front and Back. Special thanks to Rich Mandich for scanning it for me. 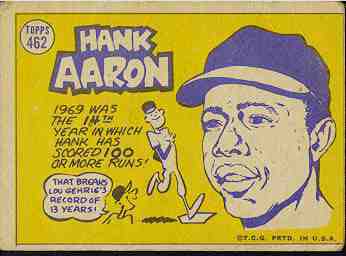 Hear Hank Aaron's talk at the National Press Club, where he discussed the poor record of the major leagues in promoting minorities into management. Hank Aaron would be pleased with the book report written by Bill Gutman when he was in the 5th grade. Hank Bauer hosts a sports talk show in San Diego. Recently he won a batting competition at the station, proving once again that Hank always prevails. Raising Three Aces is an article about this wonderful golfer from a family of golfers. Thanks to Gaia for the suggestion! The Charles Bukowski Homepage A very impressive resource. Hank Harrison - owns a publishing company and has authored some pretty interesting texts including two best sellers - it is well worth visiting his site to check them out. Hank is also the father of Courtney Love. My ambition in life is to get a standing BOOvation. Hank Nuwer is a full-time Hank. As a writer he has dual citizenship. He is an Indiana author, but his roots are in the Polish "Polonia" section of Buffalo, New York, as well as the dairy farms his Alsatian grandparents owned in Alden, New York. He is the author of 18 books, including "Wrongs of Passage" (1999), The Legend of Jesse Owens (1998), How to Write Like an Expert (1995), Sports Scandals (1994), Steroids (1990), Broken Pledges (1990) and Rendezvousing with Contemporary Writers (1988). 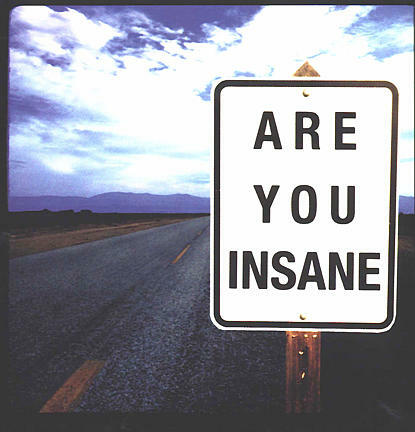 This site indexes lots of information about the man, who is a musician, poet, liar and all around intriguing personality. This is a link to information about Henry Rollin's Publishing Company. One of the most beautiful people in the world. They keep moving the page around, so I've finally linked to the main Holland Cities list. Scroll down the list and you will find Hank. Way back in May, Hank Eleazer suggested adding Henry the 8th. Of course things might have gone differently if he would have let his subjects call him King Hank! Thanks to Pamela Lee for suggesting this actor and this link. Thanks to mkelly for the suggestion. Best known for his vocal work on the Simpsons, Hank has also appeared in a number of films. Thanks to John Wills for suggesting this actor. Hank was a character actor who appeared in a number of John Wayne films. Thanks to King Spud for the suggestion. "As you may already know, Hank Hill is the title character of Fox's show "King of the Hill", airing Sunday nights just after the Simpsons. And, as you may also already know, Hank makes a living by selling propane and propane accesories." Denice the Menance is the brain-child of cartoonist Hank Ketcham. Thank you to Rod Dav4is for the suggestion! Hank McCoy, also known as the Beast, is best known as one of the X-men. Thanks to Donovan Leigh for the suggestion. Send a message to me at justhank@enteract.com (that's just Hank) and I'll include a link to any other famous Hanks that aren't listed here.